Experience 50+ mobile slots today on the Slotastic mobile casino! Tap, spin and win with the Slotastic mobile casino. Experience your favorite slots and discover our newest slots on your mobile or tablet device anytime, anywhere. Our Android users can now experience even more fun on-the-go with the Slotastic Android App. Players can enjoy their favorite mobile games anywhere in a smart and easy-to-use interface in the Slotastic App. 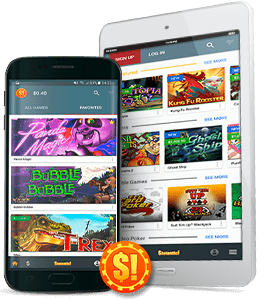 Our advanced in-browser mobile casino requires no app installation at all, so you can play without using up storage on your device. Simply access www.slotastic.com on your mobile or tablet device to get started!